There is a lot of history behind it. Just click here to see how it started. Neato! Is this a control panel thing or do we choose in the .ini file after install? Just change the sfc.ini manually or with ezini, like you have done in the past. It basically works by replacing the 3rd, 5th and 6th "resolution slots" in the .exe and sprites.q3 with a custom resolution (16:9 or 16:10). Well that's super simple. Thanks! I haven't installed it yet. Are you saying it is a new .exe or that it modifies the .exe? Or maybe something else? I'll back up the entire Taldren folder with your mods in them to be safe. Thanks. And add the tools (sfc_editor, q3_editor and modviewerHD) to the exe's folder. And all those things are needed to make the game HD or are there other tweaks in there too? Both Adam and I very grateful for all your efforts, it's just that some of us have our games so customized at this point we really need to know what's going to happen if we start swapping things around that we can't personally affect. It overwrites the files. It is not exactly a "patch". It is a direct replacement. Like if you unzip something to a folder. So, if you have customized your "starfleetOP.exe" or "sprites.q3", it is better to make a backup. Basically, for the HD to work, you just need those 2 files. But i recommend also overwriting the "aaStrings.txt" and "tooltips.txt" files. You don't need to install the other things. They were used to make the HD project, but are not required to make it run. You can right-click on the auto-installer, open it, and see what it contains. It was made with winrar. I did it this way, cause the average person, would not have patience to make all the changes to enable it. Or even know how to do it. I spent like 2 hours just tracking the images, and editing them, for them to look nice. I imagine, some people would not even bother to open the sfc_Editor or q3_editor to see what it does... imagine now spending 2 hours to change their personal copies manually. If you customized your exe, it is easier to replace it, and open the SFC_Editor and change what you need. You can also open the q3_editor, and import all the images you have into the sprites.q3 with just a keybind. I think that this is the easiest way to the end user to enable it. But i recommend also overwriting the "aaStrings.txt" and "tooltips.txt" files. OK, but why? What did you mod in there? I feel like an idiot for asking Tar to do that .exe mod now. I got the impression the HD thing wasn't related to the .exe, just spritesq3. The HD required like... changing 20 offsets in the EXE. And the sprites.q3 needed some work. Was Tar that made the "aaStrings.txt" and "Tooltips.txt" files and produced the v2561 exe to be customizable with SFC Editor. He also fixed some things on the "sprites.q3". Then i changed it in a way to enable HD to work. And if he says it is better to overwrite them, i trust on him. I also don't know everything. We don't need to get burnout trying to understand everything. We have to trust each others. Oh, ok I know what's in them now. I thought you had done some additional work in there. Were you able to fix the Mirak H&R pause button in OP too? It's not a matter of trust. We trust your intentions and your work, but if you want us to look for bugs and anomalies we need to know what to look for. You have about 0% play testing on this stuff. Dammit, tested the mirak interface now, and it doesnt work at any resolution in the packs! Have no ideia what went wrong. Have to see what happened. The others seem to work fine! Anyway, i really appreciate your wish to help Carbonite. It really needs some play testing. It seems that Orion Pirates is a bit different of SFC CE as it lacks some resolutions layouts. So some of them must be shared. I've to debug it a bit more to notice if there are some little things i missed. I'm sure soon you'll have it purring like a kitten. I am definitely hoping that all the fixes Tar did for CE can be put in the OP patch. I second this request for SFCOP. One of the things I wanted to ask was if you just copied from EAW to OP. OP has many of the improvements Tar did for CE already in there. They have significant differences. OP has many weapons and graphics that EAW lacks. The only bug i fixed in the sprites.q3 was the mirak button. I didn't copied anything from EAW to OP. Tar gave me his sprites.q3 file he was working on. And then i edited the assets that are needed to setup a new resolution. As they share a lot of similarities, was very easy to adjust the code i made for CE to work with it. So it was pretty straightforward. It is an automatized process. I need to check first with him if the sprites.q3 he gave me is bugged or not. 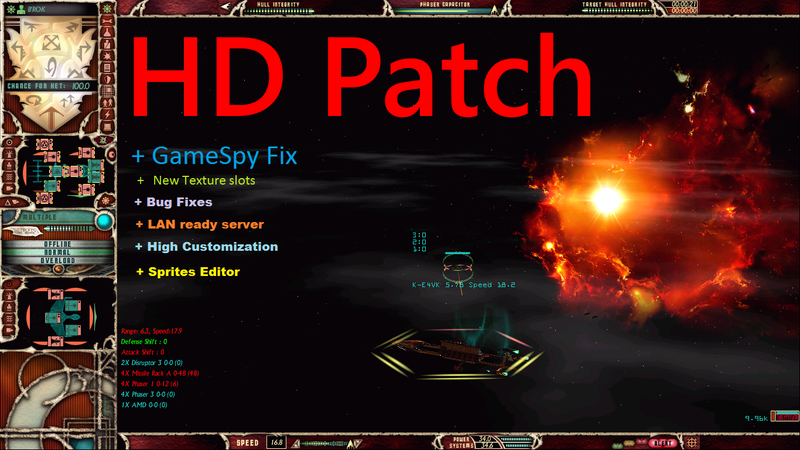 After a clean install, patch 2552, and then applying the HD patch, all started to work again. Page created in 2.083 seconds with 33 queries.